I'm playing Hearthstone, and looking my card collection I saw that I have repeated more than two cards. What do I do with the extra cards? You should disenchant them. You can do this in the My Collection screen. This will give you Arcane Dust, which is used to craft new cards. Note that there is a button allowing you to instantly disenchant all the cards you don't need. That button treats golden cards separately, so don't be afraid if you like to keep them. A small precision about disenchanting (thanks Kim Minseo) : you shouldn't use disenchanting to exchange one card for another, since it only gives you between 12.5% and 25% of the card's crafting cost, depending on its rarity. What is also worth noting is that sometimes, a patch may change the behavior of a card ; then, for about two weeks, disenchanting it will give its full value. Hence, you might want to only disenchant when you want to craft a specific card, and when cards are worth their full value. You can craft your extra cards into dust, which can then be used to craft into new cards. Because you can make any number of decks with only 2 of a card (hooray, digital games!) it's a good idea to turn anything you have extras of into dust. When you are in the crafting interface (accessible by the 'crafting' button in My Collection) you can easily turn all your extra cards into dust. If you have extra cards, a button appears in the blank space circled (since I have no extras at the moment, I have no button). You can find more details (including the cost of crafting cards) on the Hearthstone wiki crafting page. You can disenchant them for dust with the crafting system. Dust is then used to craft other cards that you want. There is a consideration to make though. 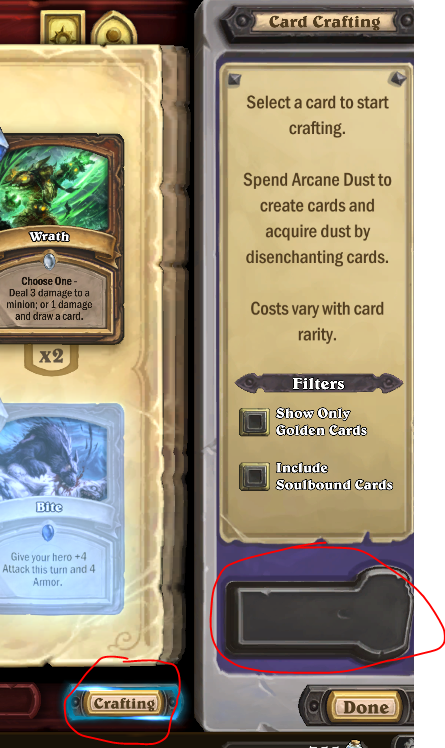 When cards are nerfed, you get more dust for disenchanting them for a limited time, so taking that into account, it's suggested that you don't disenchant cards until you have need of the dust. Is there a science to Disenchanting in Hearthstone? Are golden cards counted when mass disenchanted? If so, are they or the normal versions disenchanted first? Hearthstone: It's possible to search NEW cards in the card collection?